This page will walk through Angular CanDeactivate guard example. CanDeactivate is an interface that is implemented by a class to create a guard which decides if a route can be deactivated. The guard can be added to any component route using canDeactivate attribute of Angular Route interface. Any component which needs to use CanDeactivate guard, has to define canDeactivate method and that will be called by guard class that has been created implementing CanDeactivate interface. We can also create component-specific CanDeactivate guard. The guard will be created as Angular service and need to be added in providers array in main application routing module so that Router can inject it during the navigation process. While deactivating route using CanDeactivate guard, we need to open a Confirmation Dialog Box to take user confirmation if user wants to stay on the page or leave the page. Here on this page we will create generic CanDeactivate guard that can be used with any component and we will also create component specific CanDeactivate guard. Now let us discuss complete example step-by-step. CanDeactivate interface is a route guard to decide if a route can deactivated. Find the structure of CanDeactivate interface from Angular doc. CanDeactivate interface has a method canDeactivate that accepts arguments as given below. a. Component for which route is to be deactivated. canDeactivate method will return Observable<boolean> or Promise<boolean> or boolean . To use CanDeactivate in our application, we need to create a guard. This will be a service decorated with @Injectable() and will define canDeactivate() method. If a component needs CanDeactivate route guard then that component has also to create a method named as canDeactivate() . Find the sample output of our application for CanDeactivate guard. Now we will discuss step-by-step to use CanDeactivate in our application. First we will create an interface that will declare canDeactivate method and using this interface we will create a service that will act as CanDeactivate guard. This service will define canDeactivate method. Now find our CanDeactivate guard. The interface has declared canDeactivate method whose return type is Observable<boolean> or Promise<boolean> or boolean . In the service code, we need to call canDeactivate method using component instance. For any component which has defined canDeactivate method, that method will be called by component instnace otherwise true will be returned by the above guard. We can access current route and current state, too. In this way we have created our CanDeactivate guard .i.e. CanDeactivateGuard service in our example that can be used for any component. We will configure our CanDeactivate guard service i.e. CanDeactivateGuard in application routing module using providers attribute of @NgModule decorator. We need to add it in main application routing module so that Router can inject it during the navigation process. Create a service for Confirmation Dialog Box. We are passing an optional message for Dialog Box. The Boolean result will be returned as Observable. We need to configure the above service in application module using providers attribute of @NgModule decorator. We have created CanDeactivate guard .i.e. CanDeactivateGuard and it can be used for any component. 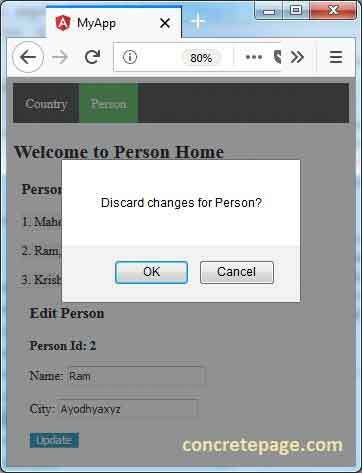 Suppose we have a component as PersonEditComponent that will perform update operation for person details. If we want to use CanDeactivate guard for this component then we need to create canDeactivate() method within this component. The method canDeactivate() of this component will be called by CanDeactivateGuard service. The canDeactivate() method of the above component will open a Dialog Box to ask if we want to stay on the page or leave the page. We need to add our CanDeactivate guard .i.e. CanDeactivateGuard to component route in routing module using canDeactivate attribute. In this way, we can use CanDeactivate guard in our application for any component. We can create component specific CanDeactivate guard. Suppose we have a component CountryEditComponent and we want to create CanDeactivate guard for this component. The guard needs to implement Angular CanDeactivate interface and will define canDeactivate() method. Find the code as following. Within canDeactivate() method we need to open our Confirmation Dialog Box. We will configure CountryEditCanDeactivateGuard in main application routing module so that Router can inject it during the navigation process. Now add guard to CountryEditComponent route in routing module using canDeactivate attribute. In this way, we can use CanDeactivate guard in our application for a specific component. 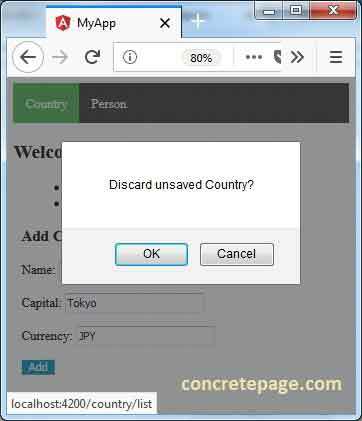 Click on the country and go to add country. Fill data and try to navigate away. We will get Confirmation Dialog Box to ask if we want to discard unsaved data.